According to CNET, (the top technology company for reviews), "Companies are only as good as the people we hire." This statement was made during the Democratic convention forum. Almost all the technology giants of the United States demanded for reforming immigration laws which would increase the economic immigrants’stay in the US. Representatives of tech giants such as Microsoft, Facebook and Amazon, urged the US lawmakers to revamp the immigration and education system. There has been a lack of interest among the minorities for STEM (science, technology, engineering, and mathematics) education programs. It hinders firms from competing globally. Some companies have been stressing on improving infrastructure facilities such as internet access among rural population in the United States. Facebook Chief Privacy Officer Erin Egan, said that "Infrastructure is a key pillar to this agenda." According to the White House, some half a million tech jobs are not occupied. The Tech giants Google and Salesforce.org promised a total of US $60 million to encourage computer education in the United States. The United States’ presidential administration will allocate funds worth $4 billion to develop five-year computer science education plans. The funding will "ensure all students have the chance to participate, including girls and under represented minorities." This is for the first time in the history of US presidential elections that immigration has been used massively by the political class. 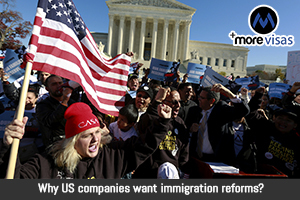 Even corporates demanded sound immigration reforms to encourage skilled migration to the US. The Democrat and US presidential candidate Hillary Clinton has plans to tie-up the Green card process with Science, Technology, Engineering and Mathematics program (STEM). Hillary will mitigate all the procedures that hinder skilled individuals from "coming to, staying in, and creating jobs in America." When it comes to Republican Presidential candidate Donald Trump, his plans are completely different. Though his anti-immigrant rhetoric has gained much attention, it is now slowly losing its charm. However, Hillary is ahead compared to Trump according to the recent opinion poll trends. If you are interested in migrating, please fill our Enquiry Form, so we will approach you to assist. And more immigration updates follow us on Facebook, Google+ and LinkedIn.